Forget what you know about deviled eggs! These deviled eggs have a real kick! Spicy Buffalo shrimp rests atop a tangy egg for a fun appetizer! Deviled eggs are such a classic appetizer. Think of all the potlucks, family reunions and Easter brunches that you’ve attended over the years. 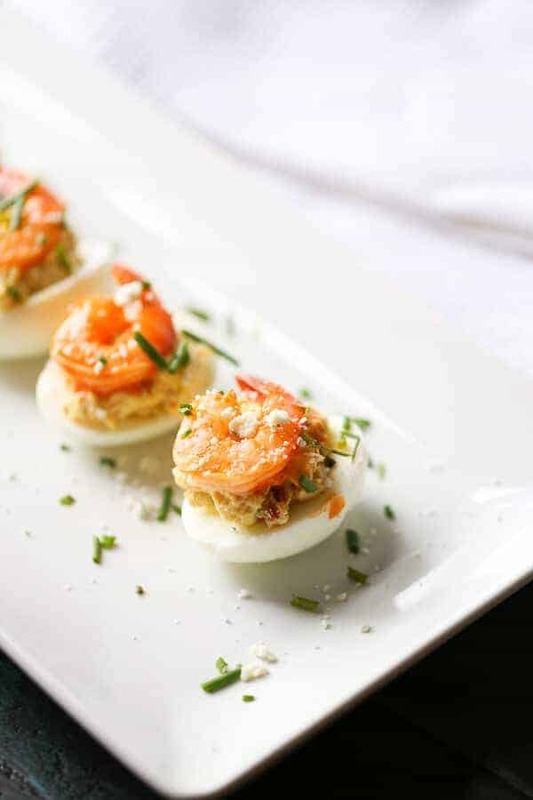 How many times have you seen deviled eggs at these events? See, they are as American as apple pie. Most often deviled eggs are simple. Simple is good, don’t get me wrong. I love a good, creamy mayo/mustard based deviled with that little sprinkle of paprika as much as the next gal. I really do, but I am also a girl who loves a little spice. Sriracha, chipotles and jalapeños are some of my favorite things in the world. In fact, the last time I made deviled eggs, I spiced them up with jalapeños and guacamole. 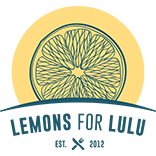 When the Ohio Poultry Association asked me to create a deviled egg recipe to share for this year’s #OhioEggRoll, I knew my eggs would have to be spicy. What better way to spice up anything than with Buffalo sauce? The filling has all the classic deviled egg elements, like mayo and paprika but I added tangy Greek yogurt, blue cheese and finely chopped celery. A few sauceless shrimp get chopped up and added to the egg mixture as well. This will add more shrimp flavor to the yolk as well as beef up the texture. The buffalo shrimp is simple; shrimp, butter and Buffalo sauce-nothing else is needed. The creamy blue cheese infused egg filling and the spicy, tender shrimp make for an exciting deviled egg. 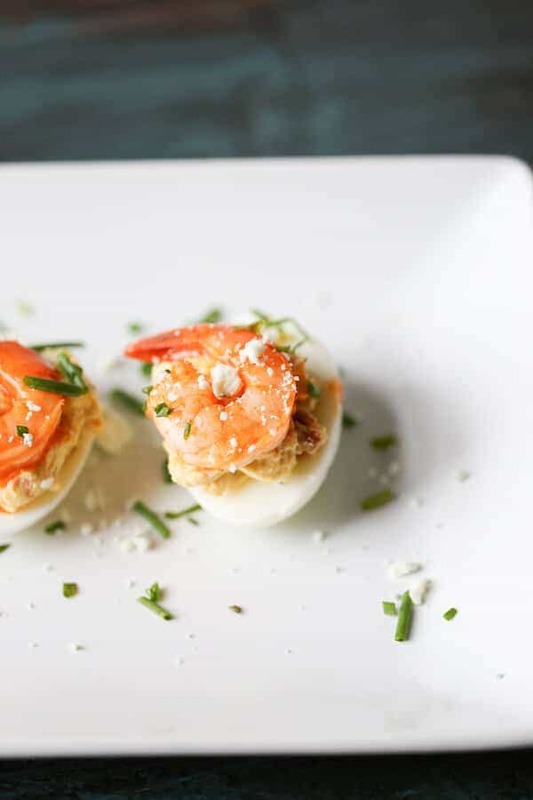 These Buffalo shrimp deviled eggs will be such a hit, people will ask for them all year long. A spicy spin on a classic egg recipe! For the eggs: place eggs in a large saucepan. Add cold water and cover the eggs by 1 inch. Bring eggs just to a boil, cover and remove from heat. Let eggs stand for about 12 minutes. Drain eggs and rinse with cold water. Gently tap eggs on your counter and carefully peel your eggs. When eggs are cool, carefully cut eggs in half vertically. Scoop out yolks and place them in a bowl, gently mash with a fork and set aside. Heat olive oil in a large skillet over medium heat. Add shrimp and cook just until shrimp have turned pink, about 2 minutes. Remove 6-8 shrimp ( you will need enough shrimp to yield 1/4 cup chopped, the amount of shrimp will depend on the size you use) and toss remaining shrimp with melted butter and wing sauce, set aside. Finely chop reserved (without sauce) shrimp. Add shrimp to egg yolks along with yogurt, mayo, celery, paprika, 2 tablespoons of blue cheese and salt. Stir mixture until filling is creamy. Arrange egg whites on a serving platter. Spoon a generous tablespoon of yolk mixture into each egg cavity. Top filled egg with shrimp. Sprinkle remaining blue cheese over eggs and garnish with fresh chives. Serve immediately or keep refrigerated. The harmless but unsightly greenish ring that sometimes forms around hard-boiled yolks results from a reaction between sulfur in the egg white and iron in the yolk. It occurs when eggs have been cooked for too long or at too high a temperature. Cooking eggs in hot, not boiling, water, then cooling immediately minimizes changes of green rings. Don’t overcook your eggs – the whites should still have a little wiggle left in them. To peel hard-cooked eggs, gently tap egg on countertop until shell is finely crackled all over. Roll egg between hands. Ohio is the #2 state in the country for egg production. 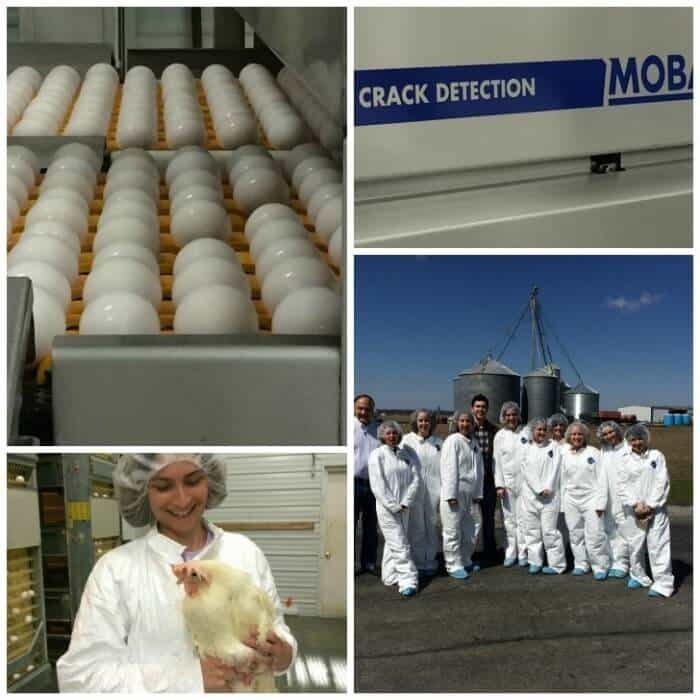 I had the privilege of meeting one of Ohio’s own egg farmers as I toured Weaver Farms last year. You can read all about my experience at the farm in this Open Faced Fried Egg Sandwich post. You can also take a virtual tour of Weaver Egg Farm in this video. Oh yeah, I’m loving this spicy egg recipe Tanya!!! Nice appetizer. You reminded me how much people really love deviled eggs. This is a nice twist on a classic. Love, love, love deviled eggs and this one is bursting with flavor! Deviled eggs are one of my favorite things in life. Can’t wait to try this recipe Tanya! Loving the buffalo shrimp action! Pinned! Is this even allowed? These looks so good! Two of my favorite things in one bite! 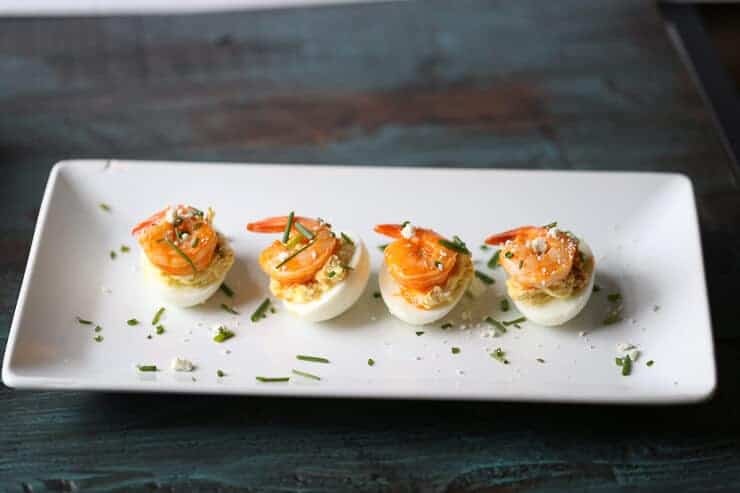 I’m not really a fan of traditional deviled eggs, but I would love these buffalo shrimp deviled eggs! Deviled eggs are such a classic but your look fantastic! What a great idea to add the shrimp! I absolutely love this idea. Spicy shrimp and eggs sounds amazing! 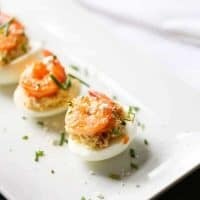 Buffalo shrimp deviled eggs? Talk about AWESOMENESS! I am so making these for Easter! Now that’s a fun way to do deviled eggs! I too love a spicy twist!! And with shrimp? Yes, please! These are awesome! I love deviled eggs- especially around this time of year! Great idea! The picture of you with the chicken might be my favorite ever. EVER. I love this recipe to infinity. And the peeling tips are great!! Such a creative twist on deviled eggs, Tanya. And thank you so much for the egg peeling tips! Those little shrimp are call my name! Ooooooohkay we adore deviled eggs but these are a whole different ball game! They sound incredible!